Andrea Pauw has been awarded a Mellon/American Council of Learned Societies Dissertation Completion Fellowship (DCF) for her dissertation, Verses to Live By: Aljamiado Poetry in Mudéjar and Morisco Communities. The Mellon/ACLS DCF competition is one of the most competitive, purely academic fellowship competitions there is. The fellowship supports Ph.D. candidates in their final year of dissertation writing, with a stipend of $30,000, $3,000 in additional funds for research, and up to $5,000 for university fees. Congratulations Andrea on this great honor and a singular achievement! If you are interested in promoting Hispanic Literatures and Cultures then Sigma Delta Pi is for you. Some of the most notable benefits are the opportunity for national awards, grants, and scholarships, which can facilitate study abroad programs and provide money for graduate research grants. Sigma Delta Pi, the National Collegiate Hispanic Honor Society, is a non-profit organization incorporated in the State of South Carolina, a member of the Association of College Honor Societies and partners with the American Association of Teachers of Spanish and Portuguese and the North American Academy of the Spanish Language. Zeta Zeta Chapter of Sigma Delta Pi is currently accepting applications for membership. Application is due Wednesday, March 27. Please return to Matthew Street, 418 New Cabell Hall. This program includes a one semester of study in Europe that will position students to research and write a substantial thesis, and to be more successful in finding their place in the global workforce. The European Studies M.A. allows for concentrations in highly relevant fields such as migration, belonging, and human rights; race and collective identities; green economies, and sustainable development; foreign affairs, religion, culture, and democracy; history and memory; and the like. Questions? Contact Professor Manuela Achilles (ma6cq@virginia.edu) or check out European Studies website. Ø She will hold andpen meeting with faculty and graduate students from 1:30PM to 2:15P at NCH-162. Students in professor Allison Bigelow's course on "Colonial Translations" (Interpretando América Latina colonial) transcribed, translated, and annotated portions of rare books and manuscripts from the University of Virginia's Special Collections Library for publication on the Early Americas Digital Archive. As Bigelow argues in the article, students in SPAN 4500 learned about colonial archives "by approaching them as public-facing, meaning-making sites of translation, interpretation, and textual editing, and by remediating print materials from the archives into annotated translations." For a list of the 11 projects published on EADA by students at UVa and the College of William & Mary, please click here. Congratulations to translators Ashleigh K. Ramos, Andreea Cleopatra Washburn, Vanessa Macias, Mawusi Bridges, Shaun Casey, Julia Colopy, Eleanor Daugherty, Taylor Dorr, Mary Catherine Gibbs, Carly Gordon, Rebecca Graham, Alison Haulsee, Brynna Heflin, Kimberly Hursh, Lindsey Jones, Katherine Lara, Nathaniel Menninger, Sierra Prochna, Kyle Reitz, Blake Selph, Alexandra Soroka, Julia Sroba, Nora Zahn, Mary-Rolfe Zeller, Emily Zhang, Patrick Johnson, Sutton White, Matt Troppe, Anthony Correia, Brent Nagel, Hannah Berk, Sarah Schuster, Abby Kamensky, Mae Flato, Molly Hepner, Kayla Pomeranz, Karla Núñez, Danielle Tassara, Emma Merrill, Taneen Maghsoudi, Kimia Nikseresht, Tara Shafiei, and Claire Gillepsie! On Wednesday, October 3, we were pleased to host a professional-development event for graduate students across the humanities with Dr. Daniel Hartnett, Associate Professor of Spanish at Kenyon College. His presentation, “Crafting a Profile for a Liberal Arts Job,” explained how students can plan their graduate study to build a diversified profile that can shine through in their application materials and set them on the path to tenure. 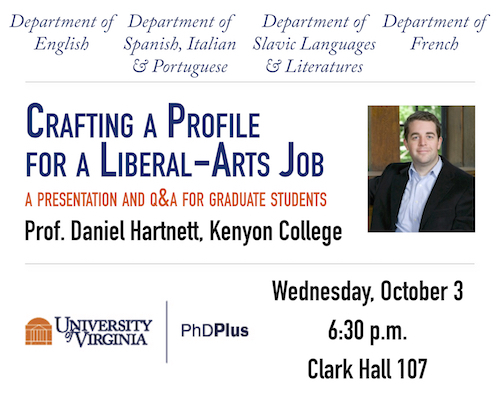 He specifically addressed the culture and hiring practices of liberal-arts colleges, and drew on his own experience as a doctoral alum of the University of Virginia to communicate how graduate students can position themselves for success in a changing academic job market. There was ample time for questions and answers from students as well. Click to download the event flyer. This event was sponsored by the Department of Spanish, Italian & Portuguese, the Department of English, the Department of French, and the Department of Slavic Languages and Literatures, in association with PhD Plus. We are excited to announce the Department of Spanish, Italian and Portuguese's second annual film festival (September 27th to September 30th). Please mark your calendars, and make this information available to your students and to other interested parties. The SIP FilmFest organizing committee has selected “Contemporary Women’s Visions from Spain, Italy, and Latin America” as the theme for this year’s festival. Building on last year’s success, recent films from Italy, Latin America, and Spain will be screened in venues on grounds and downtown. All films will be free and open to the general public, and they will be screened in their original languages with English subtitles. Thanks for your renewed support. We hope to see you and your students at the Festival! 54-year old Teresa has worked for decades as a live-in maid with a family in Buenos Aires. When the family sells the house, she is forced to take a job in the semi-desert region of San Juan. During her first stop at the pilgrimage site of the miraculous “Difunta Correa”, she loses her bag with all her belongings. This unexpected incident stalls Teresa’s life long enough to make her reappraise her existence, and the ways in which she could take ownership of it. A talk by Dr. Rocío Gordon (Christopher Newport University). Gibson-211. Since their consolidation as an urban phenomenon in the 1950s, the shantytowns of Buenos Aires have been represented in Argentine visual media, but it wasn’t until the 1990s and early 2000s that they became more permanent in television and cinema. This presentation will focus on a current trend called cine villero (slum dweller cinema) and how through the use of a digital medium and long takes, a new cinematic experience is created in which the villero becomes an open subject whose agency is reaffirmed. In the summer of 1985, two anti-Mafia judges along with their families are transferred to a safe house in a small island north of Sardinia. Sparkling seas and a gorgeous landscape fit for a relaxing holiday are in sharp contrast with the constant threats to their lives from the Mafia and sabotage of their mission from within the Italian government. Based on actual events, this is a story of friendship grounded in a mutual commitment to truth and justice. 20-year old Alma works on a chicken farm in Castellón, on the east coast of Spain. She has a profound connection with her dearly beloved grandfather even though he stopped talking years ago. When he begins to refuse to eat, Alma becomes obsessed with an idea: the only way to save her grandfather is to recover the millennial olive tree that the family uprooted and sold against his will 12 years earlier. This event has been made possible thanks to the generous support of the UVA Arts Fund for Artistic Excellence, the Latin American Studies Program, the Department of Women, Gender & Sexuality, the Department of Media Studies, the Institute of World Languages, and the Department of Spanish, Italian & Portuguese. Poetry & Poetics: Poesía at UVA. 12 Poets from 7 Countries Reading Poetry. Save the date for this semester's series on Poetry & Poetics: Poesía at UVa! Coordinated by professors Fernando Operé (UVa) and Fernando Valverde (Emory), this celebration of lyric, sound, and meaning will feature 12 poets from 7 countries reading their work. Readings by Juan Felipe Herrera, Tracy K. Smith (U.S. Poet Laureate), Carolyn Forché, and Juan Pinilla will be open to the public. Congratulations, Catherine Addington and Mathilda Shepard! Congratulations are in order for PhD students Catherine Addington and Mathilda Shepard, who have been accepted to the 2018-2019 cohort at Scholars' Lab, a hub for researchers from across the disciplines who are working on a variety of digital projects. To learn more about graduate fellowships in Scholars' Lab, or DH projects more broadly, please visit the Graduate Fellowships and Opportunities page or DH@UVA. Congratulations to Vicki Reyes Hernández, one of three students to receive this year's Distinguished Undergraduate Award from the Institute of World Languages! Vicki is a third-year student double majoring in Speech Communication Disorders (Curry School of Education) and Spanish (College of Arts & Sciences). Her passion for language stems from her hard work learning a language (Spanish) that many believe comes naturally to her. Her motivation to study Speech and Speech Pathology comes from a similar source: she understands the frustration that comes when we can't communicate our thoughts and intentions because of factors that are beyond our control. Vicki writes, "As a result, I've channeled my diligence and frustration into what is now my double major. My studies in language, from classes like Hispanic Women Writers to Anatomy and Physiology of Speech, have pushed me to acquire a global perspective on communication. The flexibility of my interests has allowed me to study Portuguese and learn about the deaf community. This upcoming summer I will be studying abroad in Belgium and the Netherlands to conduct research on the acoustical characteristics of individuals' speech when speaking foreign languages." Once she completes her undergraduate work, Vicki plans to continue her study of speech pathology in graduate school. But before that, she will work or volunteer in Latin America in order to perfect her Spanish (and maybe Portuguese, too!) in the hope of becoming a better multilingual speech pathologist. Congratulations, Vicki, on this distinguished award! We are rooting for you! Please congratulate Eli Carter for Receiving one this year’s All-University Teaching Awards. This highly competitive award recognizes excellence in teaching, and takes into account the professor's research and service accomplishments. ¡Felicidades a los alumnos de Valencia! Para mayores informaciones en cuanto al programa de Valencia, haz clic en nuestra página o síguenos en Facebook e Insta. Click through to read the March 2018 edition of La Vendemmia, the newsletter of Italian Studies at UVa. If you are interested in promoting Hispanic Literatures and Cultures then Sigma Delta Pi is for you. Some of the most notable benefits are the opportunity for national awards, grants, and scholarships, which can facilitate study abroad programs and provide money for graduate research grants. Sigma Delta Pi, the National Collegiate Hispanic Honor Society, is a non-profit organization incorporated in the State of South Carolina, a member of the Association of College Honor Societies and partners with the American Association of Teachers of Spanish and Portuguese and the North American Academy of the Spanish Language. Zeta Zeta Chapter of Sigma Delta Pi is currently accepting applications for membership. Application is due Thursday, April 5. Click here to download the application. Please return to Matthew Street, 418 New Cabell. This notice only applies to those who want to declare a major in Spanish. The Department of Spanish, Italian & Portuguese welcomes the opportunity to have new Spanish majors join our department, but in order to serve our current Spanish majors, we will not assign Spanish major advisors during the Fall 2018 Advising period (Monday, March 26—Friday, April 6). Faculty advisors in the Spanish program will only meet with their current advisees between March 26 and April 6. During this time, advisors will not be available to meet with students who want to declare a major in Spanish. The department will resume accepting Spanish major declarations the week of April 9. This semester, the last day to be assigned to a Spanish major advisor is Tuesday, April 17. If you have questions, please contact staff member Shawn Harris. The Department is delighted to announce that Professor Samuel Amago will be joining the faculty in Fall 2018. Professor Amago is an authority on twentieth- and twenty-first-century Spanish narrative and film, and also has a strong interest in cultural studies. He is the author of two monographs, True Lies: Narrative Self-Consciousness in the Contemporary Spanish Novel (Bucknell UP 2006) and Spanish Cinema in the Global Context: Film on Film (Routledge 2013), and is currently working on a third, provisionally entitled “Basura.” A Cultural Archaeology of Contemporary Spain. He is also the co-editor of two volumes, Unearthing Franco’s Legacy: Mass Graves and the Recovery of Historical Memory in Spain, with Carlos Jerez-Farrán (U of Notre Dame P 2010) and a special issue of Hispanófila, called Vademécum del cine iberoamericano: Métodos y teorías, with Eugenia Afinoguénova and Kathryn Everly (2016). A third collaboration will appear shortly, Drawing Nearer: Comics Culture in Contemporary Spain, with Matthew J. Marr. Professor Amago received his Ph.D. in Spanish literature from the University of Virginia in 2003, and has previously taught at the University of Notre Dame and the University of North Carolina, Chapel Hill. Harrison Undergraduate Research Awards: Congratulations to Melanie Turner! Congratulations are in order for Melanie Turner, a third-year student majoring in Speech Pathology/Audiology and Spanish Linguistics/Philology, who received one of 46 Harrison Undergraduate Research Awards for summer 2018. In her project, Melanie will study two sets of vocal quality terms commonly used among singers: dark/light and back/front. Previous research suggests that these terms may have similar meanings, possibly making them difficult to internalize and reproduce. This redundancy may be particularly challenging for singers who receive instruction from different teachers, coaches, or speech pathologists. If a singer gets a voice disorder, the ambiguity may also make it difficult to learn new therapeutic voice qualities and retain said vocal qualities upon their return to singing. Melanie's study will attempt to identify if any acoustic, aerodynamic, physiological, and/or perceptual differences exist between productions of these voice qualities, with the end goal of standardizing terminology in order to more effectively assist or treat singers and patients. Interested in conducting your own research? Click here to learn more about thematic concentrations in the Spanish major; click "Grants & Awards" for a list of fellowships to support undergraduate research. Additional sources of funding from the university, national agencies, and international research centers are listed through the Center for Undergraduate Excellence. Information about the interdisciplinary program in Linguistics is available here. Through Their Gazes: Screening Women and Feminism" (Keynote speaker: Prof Bernadette Luciano, University of Auckland, NZ). See the program below and the attached flyer for further information. Admission is $5 for students and $15 for non-students. There will also be a talk by the playwright, Rubén Mosquera, at 3pm on February 9 in Minor Hall 125.